During the course of Lent this year one of my goals was to perform regular meditations on Lent to enhance the effects of the already powerful practice of self-denial on the spiritual life. I wanted to learn to live Lent fully rather than just going through the motions of Lent, because I've learned that what I get out of my religious practice is directly related to what I put into it. I put significant time and effort into it, and the fruitfulness was far beyond what I had gained from any Lent before. I was inspired by the Temptation of Christ as recounted in the synoptic Gospels and decided that I would follow Jesus by spending 40 days in the desert, which is what Lent is actually intended to do for us as a church during the year; it should be uniting us with Christ in his victorious battle against temptation. We are called to follow Him into the desert just as we should follow Christ in all things, keeping His commandments because of our love for the one who loved us unto death. And it is by our love for Christ and our commitment to keeping His commandments out of that love which allows us to battle our temptations in such a way as to overcome them just as He did in the desert. Part of the journey was to begin by researching the desert as an ecosystem and a habitable environment for humans, beginning to understand what makes the desert valuable as a place to live and thrive in our daily existence. Another part of the journey was occasional spiritual insight from the Desert Fathers, the early Christian ascetics, hermits, and monastics who lived the Christian life in a fullness we in the post-industrialized West have difficulty even imagining. As they knew quite well, the liturgical life is intended to help us bridge Heaven and earth, providing a way to integrate our daily existence with the timeless spiritual life. And so my Lenten journey became a process of bridging the physical and emotional realities of life in the desert with the spiritual realities of the 40 days of Lent, drawing on the Gospels as frequent inspiration. Below are my meditations for this Lent; each meditation draws on the visceral reality of life in the desert and shows the spiritual lesson that I gained from it. Not every day has its own meditation, a fact reflective of life in the desert in which the work of daily survival can make it difficult to make time and space for contemplation, but also makes the time and space we do have for contemplation immensely fruitful. Day 1: In the desert, we learn what is truly necessary for life: food, water, and faithful companionship. In the spiritual desert of Lent, we also learn what is truly necessary for the spiritual life: the Bread of Life, the one who gives living water, and the one companion who is eternally faithful unto death. Day 2: In the desert, it is not the billions of grains of sand around you that cause you constant irritation, but rather the few that are tumbling around under your foot in your boot. How quickly we stop to pour them out if we are wise! In the same way, when we are in the spiritual desert, it should not be the many evils around us that constantly irritate us, but rather the ones we carry with us. And how quickly we stop and seek to rid ourselves of our own evils if we are wise. Day 3: Our impression of the desert is often of a somber emptiness where conditions on the rough ocean of sand are too harsh for life, but in truth deserts are full of life. The harsh sands teach the desert traveler to move with care, always aware of the landscape with its beauty and dangers. The emptiness of the desert teaches the traveler how to live without distractions, embracing each precious moment fully rather than spending it recklessly. The desert wildlife teaches the traveler to observe and respond to the small dangers in life before they become fatal problems. Life in the desert is difficult, and that is how it teaches us to live more fully. So too in the spiritual desert of Lent we often begin our journey with the impression that Lent is merely a time of somber emptiness, but it is truly a time of growing into a fuller life. It teaches us to be careful and consistent in our spiritual journey, which leads us to live the spiritual life by truly embracing each moment as an opportunity to grow in love. It teaches us to live without the distractions of our sinful addictions and seductive comforts that steal away the precious moments we have so that we might love the least of His brothers and sisters. It teaches us to watch out for the small dangers in our spiritual life, such as forgetting to pray and not reaching out in love to those in need. In confronting the difficulties of Lent and understanding our own weakness, we can learn to live life more fully as an exercise of love. Day 4: In the desert we often have the privilege of finding our limits, the difficulty of desert life teaching us humility by showing us our physical and mental limits. In the spiritual desert of Lent, the difficulty we face in relinquishing our vices and building our virtues teaches us humility by showing us the limits of our wills and our hearts. These limits are not shown to us to discourage us, but rather so that we can expand our limits so as to fill the opportunities for virtue which abound in the spiritual desert. Day 5: In the desert, it is difficult to forget the reality of death. We are painfully aware that if we fail to find water, we will die. If we fail to find food, we will die. If we do not take care to avoid the venomous serpents, we will die. So too in the spiritual desert it is difficult to forget the reality of spiritual death. We should feel keenly our lack of the Living Water, we should desire more ardently the Bread of Heaven, and we should be even more wary of the venomous insinuations of the Evil One. Day 6: In the desert, we clothe ourselves in multiple layers to allow freedom of movement and to protect us from both the scorching sun and the freezing night air. So too in the spiritual desert, we clothe ourselves in the multiple layers of almsgiving, fasting, and penance. These allow us to move more freely in the spiritual life as we relinquish the burdens of worldly comforts and protect us from both the scorching temptations of transient pleasures and the deadly sin of pride in our own self-sufficiency that so freezes our spiritual life. Day 7: The desert is an excellent place to confront our temptations because it sharpens our focus and limits our distractions, forcing us to focus on our survival. The stark emptiness of the desert prompts us to look inward at our own equally stark spiritual emptiness, our reflection in the ocean of sand showing us that we are in the spiritual desert so that we can sharpen our focus and limit our distractions in the spiritual life, our spiritual survival becoming our priority. So too in the spiritual desert we are confronted with our own emptiness, our own lack of ultimately fulfilling love. Under the conditions of life in the spiritual desert, we can gradually turn our full strength toward destroying our vices so that our virtues have room to grow as we cultivate them with love and water them with tearful prayer. Love is what flowers as the virtues grow strong in us. Day 8: In the desert, as we wander the seemingly endless waves of dunes we might wonder where the desert came from, and why we are in the desert rather than in the lush garden for which our hearts yearn. In the same way, when we are in the spiritual desert, we may wonder what caused us to be in the spiritual desert, suffering from the cold, dark nights of the soul and from the harsh, gritty sands of the heat of the soul's noonday sun rather than enjoying the delights of the spiritual garden which is cool, fruitful, and filled with abundant life. Day 9: In the desert, dust storms arise, obscuring our vision with billions of small particles. It is dangerous to breathe in the dust, for it can carry illness into our bodies. In a dust storm, it is best to close the mouth to keep out as much of the dust as possible. If necessary, we must cough to expel as many of the particles as we can from our bodies. So too in the spiritual desert, storms arise which obscure our vision of Christ with the many small worries of our daily lives and our future desires. It is dangerous to keep these within us, for they bring a spiritual sickness with them, the sickness of the fear which draws us into worldly cares and away from entering more fully into the divine life of love. If our souls become infected with worldly cares, we must expel them by offering our concerns to the Lord to do with as He wills. Day 10: In the same way that desertification happens to the land when it is recklessly deforested, overcultivated for food, and trampled by herds of animals, so too our lives undergo a process of desertification when we use our bodies recklessly, seek pleasure endlessly, and trample our relationships carelessly. Life becomes empty and dry, and we often try to do more of what we have done in a mad scramble to bring a thunderstorm of pleasure into our lives, but this too contributes to the desertification by washing away much of what little remains of our life. But take heart, those of you whose lives are a desert! It is the desert that will teach you the self-control to use your body to produce good things sustainably, that will teach you to seek real good prudently, and will also teach you to cultivate relationships carefully. Just as your life can become a desert, so too can it become a lush garden. Day 11: In the desert, during the heat of the day, mirages may appear in our vision. 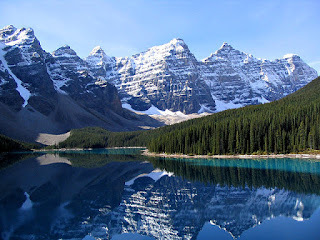 These mirages appear because our vision is limited and often faulty; the truth of it is that the water we believe is present in the distance is heated air through which the sunlight has been refracted. In the same way, in the spiritual desert we may find that what appears in our limited spiritual vision to be the Water of Life is merely an illusion, that the desires we are fixated upon are not a refreshing pool of water at all, but rather more hot air over burning sand. Day 12: In the desert, the long silences, broken only by blowing sand and our own weary footsteps, often feel oppressive. The silence prompts us to feel keenly the absence of companionship, and it gives us no rest from the rushing cacophony of our own anxious thoughts. In the spiritual desert of Lent, silence can feel oppressive as we weather temptations and trudge along in our fasting and almsgiving and prayer. It is easy to feel alone in our spiritual struggle and anxious about our weaknesses which are laid bare by our attempts at self-denial. And yet it is in the silence that we finally hear the still, small voice calling us back to the Garden, that primal oasis where the Living Water flows abundantly and our hearts rest in Him. Day 13: In the desert, we must be ever-vigilant, for the chilling nights are profoundly dangerous, just as are the burning days. The coyotes are prowling and the snakes are even more difficult to see as they wait for unsuspecting prey. It is easy to die in the desert night. So too in the spiritual desert, it is not just in the heat of the fiery passions that we must be vigilant. Even when the bodily passions have gone cold, the demons are prowling and the Evil One waits for us to stumble and fall into the pit of Hades where we will suffer spiritual death. Day 14: The desert is a wonderful gift to us; the sparseness and dryness of the desert lead us to yearn for the lush garden where the water so necessary for life is abundant and pervades our existence. In reminding us of how essential the water is for us, the desert prompts us to turn back toward the garden where we can find life once again. In the same way, the spiritual desert is a wonderful gift to us. The sparse and dry spiritual landscapes which our souls traverse help us to understand how very good Christ is, He who brings us Living Water, the water of eternal life to which He calls us, the water which springs forever in the Garden to which He alone can restore us. Day 15: In the desert, dust is ever-present, a reality which permeates the landscape and, when the winds blow, reminds us that what appears to be small and harmless can become a grave danger to us. It is a reminder of our fragility and mortality, a warning that we shall return to the dust in the end. So too in the spiritual desert, distractions are ever-present, and the images of sin permeate the landscape of our lives. What appear to be small and harmless entertainments, indulgences, and lusts quickly become grave dangers to us when the winds of life begin to strengthen and we are toppled over as we try to carry all these things into the wind of life's challenges. We are thereby reminded of our weakness, that we will face death in the end, and given a warning that spiritual death is very near. Day 16: The desert foliage blooms in brilliant color where the river flows, the steady stream of water allowing the flourishing of plants and animals. In the same way, we can flourish when we live in contact with the steady stream of the water of life, the living water which is found by those of us who seek it and given to those of us who ask for it. We can seek this living water and ask for it; we can also continue dropping our empty rusted buckets into the same old well from which we get our familiar pleasures, increasingly finding that the water from the well satisfies our thirst less and less as we drink it. Those of us whose wells of familiar pleasure bring forth water which no longer satisfies can begin to move ourselves across the desert to live on the river, enjoying the living water that allows us to flourish. To travel the desert is difficult, but for living water that will help our lives grow into brilliant gardens, the trials of the journey are worth the glory of the destination. Day 17: In the desert, we are forced to meet ourselves. Our physical weaknesses are frequently on display, our mental fortitude is shown to wear down quickly in the face of the tedium of a day's walk in the bleak wasteland, and our hearts yearn for even a moment of connection with another person who can pull us into a moment of joy that we cannot find so easily within. So too in the spiritual desert we are forced to meet our own souls, so weak and frail as we strive for union with the God who created us, who sent His only Son to redeem us, and restores us in the living waters by the Holy Spirit who first hovered over those waters. In recognizing our weakness humility arises, and as we turn to Him in repentance our souls finally bend low enough to accept the honor of eternal glory which our God so desires to give us. Day 18: The desert is a place of cleansing, not because there is plenty of water with which to wash our bodies gently, but because like the strongest soap it is abrasive and harsh, wearing down the rough edges created by the dirt we have collected on our bodies. In the same way, the spiritual desert is a place of cleansing for our souls. The cleansing of the desert is painful because it abrades the filth clinging deep in the recesses of our being, but it is a pain that allows us to experience the immense joy of living in freedom from the filth that was weighing upon us, making our lives purer so that we can spend our time loving openly in the brilliant sunshine rather than hiding our lusts in the cold dirty darkness. Day 19: In the desert, we must leave behind many of the comforts of the city, of the lush forest, or the ocean villa. Our priorities must change in order to thrive in the desert; we must sacrifice many comforts in order to retain what is most valuable: life itself. If we would take up our cross and follow Christ, we must follow Him into the desert, leaving behind our comforts just as He did. Just like the rich man who wanted to follow Christ, but in the end could not let go of the comforts of his wealth, we so often do not want to relinquish our comforts and follow Him into the desert. Following Him into the desert would mean that we and our priorities would need to change, and how we struggle against anything that would ask us to step out of our comfort zone and into the harsh, dry land where we can grow precisely because we are uncomfortable! And so we follow Him into the spiritual desert, because this via dolorosa is the road to eternal life. Day 20: In the desert, as we learn the perils of wandering in the sun's burning heat, we at first might feel as if the sun is the enemy. It prevents us from traveling at whatever time is convenient for us. Its heat prompts us to seek shelter, forces us to wear garments that cover our bodies thoroughly, and makes us painfully thirsty for the cool water of the oasis. So too in the spiritual desert, as we learn that our God is a consuming fire whose heat and light we cannot escape, we might feel as if He is our enemy. He prevents us from actualizing our transient pleasures whenever our desires for them arise. In becoming closer to Him, we find that we must be transformed as our impurities are burned away in the fires of divine love. And yet, this is the only way to quench our thirst for the Son who is the Living Water. Day 21: In the desert, Christ faces those most difficult of human temptations: the lure of enjoying comfort food, the lure of attaining absolute power, and the lure of believing that we deserve to be saved because of our own righteousness. He emerges from the desert having resisted those temptations successfully, showing us that even in our human weakness it is possible to resist our temptations and emerge from the difficulty of our lives as masters of our passions rather than slaves to them. So too in the spiritual deserts through which our souls travel, we will face the temptations of finding comfort in food rather than in prayer, seeking power over others rather than cultivating love for them, and being sure of our own righteousness rather than working out our own salvation in fear and trembling. What a sweet victory it is to overcome the temptation to take refuge in transient comforts and false senses of security, emerging from the desert freed from the ties that bound us before entering the desert! Day 22: In the desert we learn that our great enemy is fear; it is fear that prompts us to drink all our water quickly instead of rationing it so that we might live. It is fear that has us spending all of our energy in a short burst to try to escape the desert rather than adapting to it so that we might learn how to live. Life in the desert requires us to conquer our fears, to make our choices based not on what is frightening to us but rather on what is truly good for us. In the same way, fear is our great enemy in the spiritual life; it is fear that prompts us to enjoy all the transient pleasures of life quickly, leaving nothing to sustain us later in our journey. It is fear that has us desperately trying to escape the spiritual desert by getting lost in the fantasies so readily available for our consumption, trying to avoid the necessary changes to ourselves that will change our quality of life for the better. Life in the spiritual desert helps us to conquer our fears by prompting us to face them; thus we can begin to choose freely the love that is offered to us rather than running from it in fear because it would change us profoundly to love so deeply. Day 23: In the desert, honesty becomes a necessity; if we are not honest with ourselves about our limitations and our resources, then we will make the wrong decisions. If we are not honest with our traveling companions about our limitations and our resources, then they will make the wrong decisions. The desert has plenty of room for movement, but little room for error; wrong decisions often lead to a long death. In the desert, honesty is often the difference between life and death. Just as in the desert honesty with ourselves and others is a necessity for life, so to is it a necessity in the spiritual desert of Lent. We will only grow and become healed of our wounds when we admit our weaknesses to ourselves and others so that pride, the source of spiritual death, will not overtake us; and thus we will find the gift of humility, the water of the spiritual life which sustains us and allows us to thrive in the spiritual desert. Day 25: In the desert, we can learn very quickly that we are still very much like children. We may not cry out as often, but we often feel painful cravings for food and water at all hours. Our constant sense of wanting, wanting all the day long for a cool place to lay, and then wanting all night long for a warm place to drink and eat, is like the child who has not yet learned self-control, who is still enslaved to their impulses. In the same way, in the spiritual desert we are very much like children. Even while the brilliance of the Son shines on us in the Eucharist, we long to lie down and enjoy the cold comforts of the flesh. Even while the dark night of soul reminds us of the glory of the Son, we long to lie down and enjoy the brief warmth of our carnal passions. We are the spiritual children of the Father who have not yet learned self-control. Day 26: In the desert it is easy to despair, to look at the beautiful sunset and see only the dangers of the cold night ahead. It is much more difficult to hope, to trust that traveling through the dangers of the cold night will help us to grow in strength and wisdom. If we give in to despair, letting the dangers fill our vision so that we can see nothing else, then we are looking forward to our own doom. But if we hope, filling our vision with the ways in which we can thrive, then we are looking forward to our own flourishing. Because we tend to find those things on which we direct our gaze, it is better to put aside despair and hold on to hope, directing our gaze toward that which allows us to flourish! Day 27: In the desert, water can be difficult to find, and one of the best ways to find water is to go down to the low and shadowed places, for that is where water can collect and remain despite the assault of the blazing sun. Though we may have to lower ourselves to capture it, the water that sustains us is worth it. In the same way, one of the best ways to find living water in the spiritual desert of Lent is to seek out the low shadowed places in our lives with sincerity, lowering ourselves in humility so that we might drink of the water that remains despite our sufferings, a water we can count on to keep us from death. Let us remember this water and return to it, and waste not the gift we receive in the desert by carrying it with us always! Day 28: In the desert, there will be times when disaster looms, not just in the mind, but in the harsh dryness of reality. During those times when we exist on the hard edge between life and death, our self-control exhausted, then we will fall back on our habits and it is our habits which will decide whether we live or die. Our life or death will not be decided in that moment, but rather by the hundreds of decisions we made over the course of months and years which formed our habits. Now is the time to build the habits that lead to life so we might not lose it later. In the same way, now is the acceptable time to build the habits that lead to life in the spiritual desert of Lent, habits that we can count on in the moments when we come to the edge of spiritual life and spiritual death so that we might pass from death on to a new life in the garden that awaits us at the end of our journey through the desert. Day 29: In the desert, we learn that it is best to be grateful for the oasis we reach at the end of our day's journey. We do not harbor resentment over the difficulties of the journey, but rather delight fully in the joys of the oasis, slaking our thirst on water which is truly necessary for life. In the same way, we learn in the spiritual desert of Lent that it is best to be grateful for our daily prayer. Though the dryness of our daily toils abounds, we can delight fully in the joys of prayer, in lifting up our burdens and casting them off so that we can slake our spiritual thirst in true freedom, drinking and savoring gratefully the water which is necessary for the spiritual life. Day 33: The desert is an uncomfortable place for those who are not accustomed to a life in which the essentials are what drive our decisions and our pleasures are mostly simple and necessary ones. But for those of us who live in the desert, we can become comfortable with our lack of comfort, and this is both an opportunity and a challenge. We can then come to see our life in the desert as a mundane life of drudgery, our comfort with the desert transforming into a weariness and resentment of its difficulties. Or we can understand that our life in the desert is an opportunity for learning and growing, our comfort transforming into an invitation to thrive as we travel through the desert in search of the lush garden that awaits us when we find the river that sustains life. So too in the spiritual desert we can become comfortable with the self-denial requisite for our spiritual growth, choosing to see it is a needless imposition of hardship on us by God, or choosing to understand that our life in the spiritual desert of Lent is an opportunity we have been given to grow in such a way that we can transform ourselves in Christ's living water, following Him to Paradise. Day 35: In the desert, those who learn to survive and thrive find a peace of heart that surpasses the understanding of those who have never freed themselves from the luxuries and comforts of the city, the palace, and the garden. The desert life is a centered life, a firmly grounded life unlike that of the ever-changing cities and palaces and gardens where novelty and transient pleasures reign supreme. In the same way, those who learn to thrive in the spiritual life find a peace that surpasses all understanding. They are centered on a life of prayer and firmly grounded in laying down their lives for the good of others; they are not ruled by a compulsive search for new things or brief sensual pleasures. Day 37: In the desert, the wise travelers seek out companions to travel with them. In the dry harsh land where life is difficult, fellow travelers enable us to share our labors, our sorrows, and our joys. We can support them when they are weak and they can do the same for us, ensuring that we all have a better chance of reaching the water of life at the end of our journey. In the same way, traveling the spiritual desert of Lent is better with companions with whom we can share our spiritual labors, our sorrows, and our joys. We can support one another in prayer and fasting so that we are all strengthened in such a way that we all have a better chance of reaching the water of eternal life in the lush garden of Paradise. Day 38: In the desert, when we find and follow the river of life, we may notice that it takes us over rocky ground as it draws us lower into the valley where the lush garden awaits at the river's edge. There is no way to reach the garden without traveling the rocky ground and lowering ourselves into the valley. 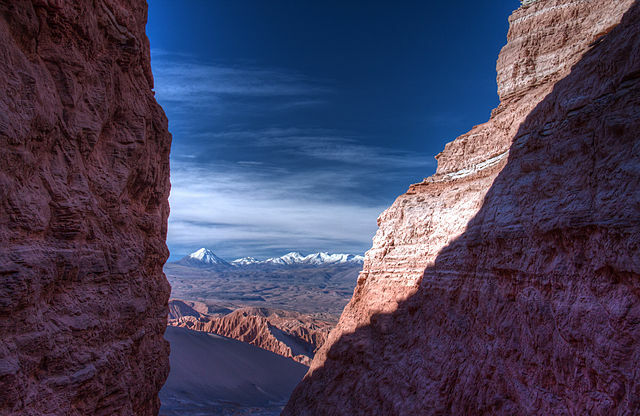 In the same way, in the spiritual desert of Lent, we must lower ourselves into the valley of humility and endure the rocky hardships of life in order to reach Paradise where we can drink of the water of eternal life in the garden to which we are meant to return. Day 39: In the desert, the experienced travelers know that while the lush garden that lies not far ahead is the better destination, it was the dry desert that taught us to appreciate the bounty of water in the lush garden. And that it was the harshness and the bleak landscapes of the desert that taught us the value of the gentle pastoral environs we encounter in the fields and forests of vibrant greenery. And that it was the truths we learned about ourselves in the desert which prepared us to live responsibly in the lush garden. In the same way, in the spiritual desert of Lent, the experienced know that it was the spiritual dryness of Lent that taught us to appreciate He who is the Living Water all the more. And it was the veiled glory of the sacred artwork that showed us once again how glorious the beauty of our churches is when that art is once again unveiled. And it was truths we learned by fasting and almsgiving which prepared us to live responsibly in times of plenty, knowing that we have more to give the poor when we live sacrificially as Christ lived. Day 40: As we leave the desert, following the river of life to the garden, it is only natural that we rush toward the garden with joy, anticipating the abundant life we will find there. It is the desert which prepares us to live life with loving gratitude for the immense wealth of the garden, for we know what it is like to live without the lush provisions of the garden. In the same way, as we leave the spiritual desert of Lent, it is only natural that we rush toward the Risen Christ with great joy, anticipating the abundant life he has prepared for us in Paradise. The spiritual desert of Lent has prepared us to accept this gift of the risen life with humble gratitude, for we know what it is like to have a sparse life on the burning sands and hard rocks, a life without the lush abundance of the eternally flowing water in Paradise. Note: The above is an image of the Valle de la Luna in the Atacama desert. 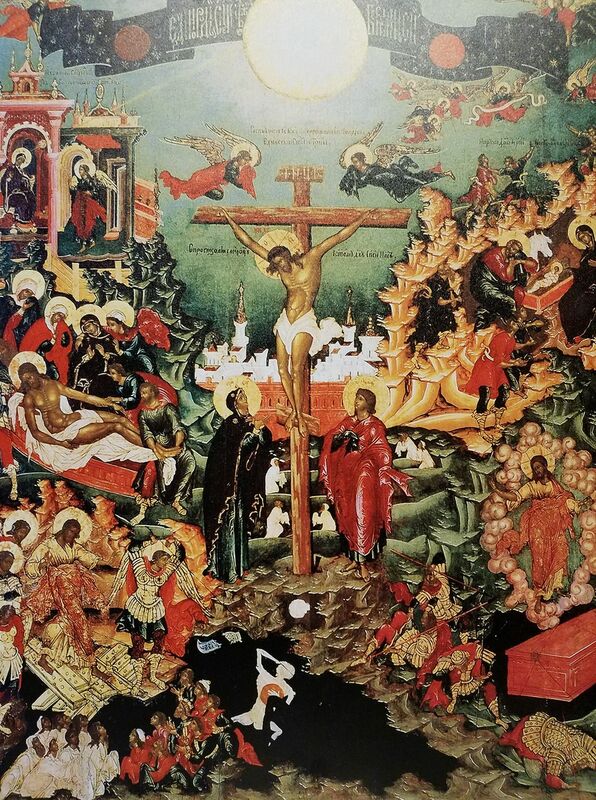 On Holy and Great Saturday, Christians in the ancient churches celebrate Christ's descent into Hades, known as the Harrowing of Hell in certain English-speaking circles. A recent article at Salon seemed to suggest that we would rather not acknowledge Christ's descent into Hades (or Sheol), but this seems odd in light of the fact that the ancient churches all have an official celebration for it of some kind and it is referenced in the Apostle's Creed. In both the Western Catholic and Eastern Orthodox traditions this day (which I celebrate today with my Orthodox friends according to their liturgical calendar) is acknowledged as a day of rest and waiting appropriate to the Sabbath. It is simultaneously acknowledged that just as Jesus healed the man blind from birth on the Sabbath and gave him a life more beautiful than he had ever imagined possible, on the Great Sabbath our Savior healed the world of its attachment to death to give us a life more beautiful than we can imagine is possible; by His death, Death itself was trampled down, rendered powerless by the power of Love. Christ our Love, the one who is Love, opened the way to Heaven from Hades; just as He who is Love transformed the world for all time by His entrance into the world, so too He transformed the underworld by His entrance into Hades, ending the separation of the righteous dead from the eternal life God so desires for them and for all of us. In making it possible for us to join our Love in eternal life by ending that separation, He showed us how it is possible for us to be separated from our sin, to be truly healed of our egotistical whims which separate us from participating in the divine life of our Love. Christ showed us an image of the death of sin by showing us His death on the cross; just as He bore our sins fully with us in the sacrifice on the cross, so too he showed us how to loosen the shackles of sin and be liberated from our slavery to our own transient desires. Just as Christ let go of life in the flesh by the ultimate act of love, so too must we let go of life in the flesh by our acts of love for others, trampling down the sin that causes our death by dying to sin. Just as the death of what is human and bears all sin on the cross was what brought about the possibility of the divinized life through sanctification, so too is the death of what is merely human in us, the egotistical whims, is what brings about the possibility of full participation in the divine life of love. The death of sin requires us to follow Christ into the underworld where our souls wait in hopeless darkness, to confront our sin and reject it so powerfully that we are repulsed by it, propelled by the sheer force of love for Love out of the tomb with Him and into a radically transformed life in which we love the world so strongly that we pull it towards its own radical transformation, participating in the divine life of love which transforms all of creation. Christ shows us that the only way to triumph over death is to greet it with joy, a loving acceptance of the fact that union with our beloved requires us to die to death by dying to its cause, the sin that separates us from the eternal life in union with God the Father. He also shows us that this triumph will inherently involve great suffering, that separating ourselves from the sin which separates us from God means entering into the Dark Night of the Soul with its difficult struggles as we work with Christ to become more like Him so that we can leave our attachments to the flesh behind and exist in the perfect freedom of love in the presence of Love. The death of our Love has made possible our eternal life in Love; we can now love to death our attachments to everything which separates us from Love, letting our embrace of death on the cross of our life's sufferings open us to the possibility of eternal life by way of our death for the sake of our love for the one who loved us unto death. In Christ, we can love to death our love of the sin that brings about our death, choosing to follow Him in the way of loving to death all that separates us from the Love of God. Christ has made possible the impossible in allowing us to transcend our false love of sin which leads to our true death; we can now love to death our love of death. 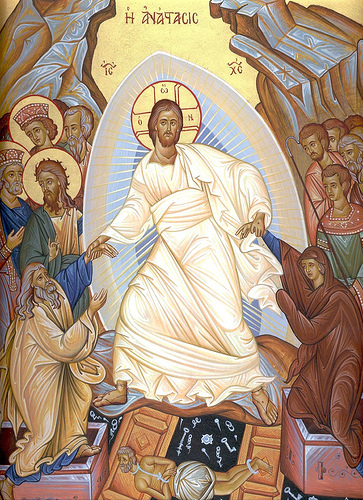 Note: The icon above depicts Christ's triumph over the grave. Fair Questions: Why did I change my position on the ordination of women? I promised a young friend of mine that I would explain why I no longer make the case that women should be ordained as priests under the same circumstances in which men are ordained in the ancient Christian churches (Eastern Orthodox, Coptic Orthodox, and Catholic). It is understandable to question why I would change my mind on the issue when I had so clearly arrived at the rational and enlightened position, specifically that women were equally qualified for the ordained priesthood and should be allowed equal access to the decision-making power which accompanied that ministry. So why did I change my mind? Did I suddenly abandon my egalitarian ideals and give myself up to the rampant misogyny of a culture that treats women as objects? No. I'm still quite egalitarian and opposed to objectification in its many hideous forms. Did I have a bad breakup and start believing that all women are malicious? No. Quite the opposite, actually. I've come to realize how incredibly good and admirable women are, and part of that is because of my experience of relationships with women. As is my habit, I re-examined my views and over the course of several years realized that my previous thought process had some serious problems. The first step was that in examining my analytical approach, I found that I was being inconsistent and incoherent in the way I was choosing and applying it. The second step was to use a coherent and consistent analytical approach to work my way to a conclusion on the question again. The third step was deepening my understanding of what it is to be human and the differences between men and women. What standard of evidence do we use? Realizing that I needed a more neutral standard that could be applied to a wider variety of situations, I changed the standard of evidence such that a positive case was required for anyone at all to be ordained to the priesthood, whether male or female. When reviewing the evidence, it was fairly clear that the positive case for men being allowed to be priests within Christianity was strong based on the Twelve Apostles selected by Christ being male, the fact that their chosen successors were male, and that the successors of their successors were male for approximately 2,000 years (despite there being at many points highly educated, holy, and humble women who would seem to have possessed the personal qualities desirable in a public minister). It was also fairly clear that the positive case for women being allowed to be priests within Christianity was not nearly as robust. There is a mention of a woman in what seems to be some sort of leadership role in the Epistles, and there is a history of deaconesses in the early Church who performed limited liturgical functions. Of course, the insistence in the Epistles that a woman should not be given authority to teach seems to cut against the idea that they would be allowed in the priesthood, but perhaps it was simply a culturally-specific prohibition rather than a universal one. After all, women were unlikely to be given the education necessary to teach in the culture of the day. Any good analysis of a problem should start with precise definitions, and this is an area in which I failed pretty spectacularly. My understanding of a priest's role was not completely simplistic, but the way I defined it for the purpose of answering the question at hand was primarily as "the person with the power in the parish" or "the leader of the Christian community" (with the understanding that leadership was about having power). I have since come to a much more accurate understanding of the ancient Christian view of priesthood, and in particular of Christian leadership. In the Christian moral framework established by Christ, the leader is the one who is first to wash the feet of others as He did at the Last Supper. The leader in the Christian worldview is the servant of all, the one who is called to serve humbly, to humble themselves by placing themselves below others and giving all they have to benefit others. Or as it is occasionally referenced, "the first shall be last..."
The political understanding of hierarchy is inverted in the Christian worldview; the leader does not stand above the rest of the Church which is responsible for the leader, but rather the leader kneels below the rest of the Church supporting them because the leader is responsible for acting to restore their well-being. For example, this is why the Roman Catholic Pope is called the Servant of the Servants of God. In light of this correct definition of Christian leadership, it becomes clear that my previous definition of priesthood as Christian leadership was importing a definition of leadership from the political realm as I was familiar with it and substituting the political understanding of leadership for the Christian one. Is it true that only men are called to humble themselves in a special way as distinct from the way in which women are called to humility? If so, then is this because women are inherently greater than (at least some) men and deserve our service as men? Is this because some men are defective in a way that women are not? And whether we answer either of those questions, why is some authority and a certain faculty granted to those who act as Christian leaders in the priestly capacity (perhaps in spite of their defects)? Are men inferior to women? This is a question that as a man I really want to answer firmly with a resounding, " No!" Sacred Scripture makes it fairly clear (both in the Gospels when men are called to serve all with humility at the Last Supper and in the Epistles when Paul discusses the duty of men to behave in a radically self-giving way toward their wives) that men need to humble themselves and serve women, loving them as Christ loved the church, which is to say living in love for them unto death, ultimately dying for them. Women are called to obedience, humility, and self-giving as well, but why the extra self-giving for men? Why do men need to go the extra mile? I am reluctant to conclude that Christianity proposes that men are inferior to women because we men are called to humble ourselves in a special way to serve women. So why was I so willing to believe that Christianity proposes that women are inferior to men because (I assumed) that women are called to humble themselves in a special way to serve men? That was mostly because I was assuming that some fallacious straw man arguments were correct, and I will cover my failures in that area later. Why do men need to humble themselves more than women? The inclination of men is to not believe that we are defective, to refuse to concede that we are weaker than women in any way. Our self-concept is often that of the strong and confident warrior who will never break down. But the scientific evidence strongly suggests that in some critical ways, we are indeed weaker. It's fairly well-known that women live longer on average than men, for example. It is less well-known (to scientists, at least) that there are certain significant differences in how men and women evaluate risk. For those of us who are not scientists, this point may be more obvious. For women, it's probably also obvious how laughably stupid men become in the presence of women they find attractive. None of this is to deny that women have many difficulties and frailties as well; all of us human beings have a large share of cognitive, perceptual, and medical issues. It's also clear that men on average have distinctive weaknesses, weaknesses which may complement the weaknesses of women and are quite different from them. One of those on-average weaknesses turns out be a lack of humility. We are less willing on average to accept our weaknesses, especially in light of the strengths of others. It turns out that we men are indeed often in need of additional work in learning humility, and so the Christian call to men to humble ourselves more deeply than women makes a great deal of sense. Why does the call to humility come along with authority? It can be tempting to answer this question by pointing to Jesus, who humbled Himself more profoundly than anyone else while being the ultimate authority and exercising that authority, albeit as one presiding in love. Or we could go back even further to Adam, the first man, who was a giant idiot in the presence of the first woman. It was fairly clear that Eve was created to be his companion and serve him, and some have made the argument that women are inferior on this basis. Interestingly, these arguments are made quite commonly by people who don't believe the Bible is authoritative along with the usual misogynistic suspects who are attempting to use the Bible to justify their mistreatment of women. At one time, I also believed that the standard Christian view was that women are inferior based on Eve's actions in the Garden of Eden. It turns out that I was wrong, and in an embarrassingly obvious way. Had I bothered to take a quick look at the Vatican website, I would have found out that the Catholic Church calls the sinful events of the Fall "Adam's sin" and Paul attributes the responsibility for the Fall to Adam. So why would the Church call it Adam's sin while admitting that both Adam and Eve committed a personal sin? For a very simple reason: he was in charge, which in the Christian view is another way of saying that he had a serious obligation to serve her and was responsible for her care. Instead of using that responsibility to prevent her from committing a grave sin, he joined her in it and brought the consequences upon them both. So is the man being picked on unfairly here? Shouldn't the Church take the view that Adam and Eve were equally at fault? To understand why the person who has the responsibility to serve others and care for their well-being should also have a corresponding measure of authority, we do not need to go back to Jesus or Adam. Consider a public school classroom in which a teacher is there to serve the educational needs of the students and care for their well-being. How well could the teacher care for the well-being of the students without the authority to set boundaries on their behaviors that might cause harm to themselves or other students? Who is blamed when the teacher fails to protect the students from harming themselves? Yes, the student may get some of the blame, but it is the teacher who will get most of the blame because they are the responsible party. And who would argue that the authority of the teacher implies that the students are lesser in value because they lack authority? If anything, most of us would value the children more highly than the teacher and put the children's well-being first. This is precisely how Christian authority is intended to work as demonstrated by Christ; the person in authority acts for the good of those in their care and puts them first. Those who seem to be last in the eyes of the world are first in the eyes of Christ. What authority does a priest have? As a young man I had a very wrong impression about the authority of a priest, both in its proper scope and its practical limits; I thought it looked pretty grand. The Catholic Encyclopedia has an excellent article on the priesthood that helped correct some of my misconceptions. Reading Canon Law helped me to understand the situation better as well. It turns that the amount of obedience expected of a priest is far greater than the authority granted. A priest must, according to Vatican II, not change the liturgy on his own authority. Instead, he is required to obey the liturgical norms set out by the Church. The priest must obey his bishop, his immediate superiors in any religious order of which he is a part, and the Pope. The priest must also obey by instructing people from the teaching of the Church rather than from pure personal opinion. He must administer sacraments to those who need them and must obey Church law by denying the sacraments to people when required by the law. The actual scope of authority of a priest turns out to be quite narrow. Anyone wanting to be a priest is signing up for a whole lot of obedience and not much power, which is not to say that there are not men who have tried to enter the priesthood for ignoble purposes. Like any other vocation, it looks a lot more glamorous than it is when you're looking at it from far away and don't understand the daily work. And there are certainly priests, Bishops, Cardinals, and Popes who have seemed more interested in using their authority for personal gain than living out Christ's call to radical service to others. As in the case of Adam, their responsibility comes with a corresponding increase in blame when they fail to live out Christ's example, as it should. The consequences for their failure to serve others so as to help them reach salvation fall upon them harshly, according to St. John Chrysostom and others. The blame does not fall upon those who are led astray by those in authority, but on the shepherd who neglects his sheep. This is a risk that is taken by the Christian leader, that in taking on greater authority, they also take on a greater risk of condemning themselves by their actions which do not model Christ's care for His flock. And while many people believe the myth that priests rule with absolutely unquestioned authority, their authority does not imply that they should never be questioned or corrected, according to St. Thomas Aquinas and St. Augustine. St. Thomas Aquinas, Summa Theologica II, II, q. 33, a. 4, Sed Contra. Given that they are subject to correction by those in their charge , I'm not so sure that people should be looking forward to being a priest for authority's sake. As with any other vocation, it makes the most sense to do it because you love it and are called to it. So what's the reason for my change of mind? As with most of my changes of position, there was no silver bullet argument that brought down my previous argumentative edifice. But when many of my premises were revealed to be incorrect and my analytical approach ill-fitting, that made it impossible to go back to the same starting point. And unsurprisingly, choosing the premises and analytical approach more carefully to mitigate my confirmation bias forced me to confront the fact that my views were incoherent with Christian thought and could not be sustained without rejecting fundamental aspects of Christian teaching. In order to persist in my views, I would have needed to reject Christ's understanding of leadership and accept a purely or mostly political understanding of leadership to put in its place. And how would I reject Christ's understanding of leadership (or accept the idea that Christ did not actually choose men for those roles) without rejecting Sacred Scripture as authoritative? And if I reject Sacred Scripture as authoritative, how do I have any evidence of what Christ would propose as a model or leadership? Would I not be forced to believe that he existed as a historical person, but remain agnostic on the question of his views in the absence of evidence I could accept as persuasive? I could choose to persist in my belief that women should be ordained priests or face the fact that my views were an implicit rejection of Christianity, abandoning my difficult faith in favor of a much easier uncertainty. I could not do both. And so I took a position that I knew would probably cause me to be labeled a misogynist by some feminists and a purveyor of misandry by some men's rights activists. Not a comfortable position, but my experience has been that being coherent is seldom comfortable because it requires us to look at the evidence and then reason our way to a conclusion. As human beings, we are much more comfortable assuming our conclusions are true and finding a way to shift the evidence to support our conclusions, which is exactly what I was doing before. On Good Friday, Catholic churches in many places around the world celebrate the death of the person believed by Christians to be the Messiah promised in the Tanakh, which Christians term the Old Testament. At the crucifixion of Christ, we see the turning point in His ministry to the world, the moment in which He suffered for the sins of the world, a moment which pervades the world without respect for the limits of time so that it can be transformed in such a way that it is awakened to the possibility of living once again in full union with divine love. Good Friday is centered upon the death of Christ, and rightly draws our gaze to the cross which is the instrument of death, calling us to participate in the sorrow which is inevitable for those of us who recognize the tremendous depth of love which Christ shows. We weep with Mary, the Mother of our Lord, and also with those others who gathered at the foot of the cross to witness the end of His life. We Easter people know that it is not the final end, and all Christians must remember that it is not the beginning. The sacrifice on the cross was not an end in the sense of the end of a story, but rather an end in the sense of a telos, a purpose for which the sacrifice on the cross was a means. It is an end He pointed to time and time again in the Gospels, and not just when He specifically instructed us to take up our cross and follow Him. He showed us the end when washing the feet of the Apostles and said, "This is my body." at the Last Supper. He showed us the end when He asked the wealthy man to sell all that wealth and give the proceeds to the poor. He showed us the end when He multiplied the loaves to feed the five thousand, and when he healed the blind man who had never seen. He showed us the end when He spent 40 days in the desert battling the hardest temptations for us as human beings to resist. He showed us the end when He was born into a poor and humble place rather than into the most pleasant of human comforts in a royal palace. As we look at the life of Christ in the light of the cross, we see that the end was visible all along, that the end was a life sacrificed for the good of the whole world, a life that is a gift freely offered and freely accepted by those willing to enter into that life. We see that to live our lives fully, we must reject comfort in favor of service that requires sacrifice; we see that to attain true greatness, we must be emptied of our selfishness so that we can be filled with divine love and thereby be transformed, rising to a new life just as Christ did. It is obvious that Jesus' life is a model for the lives of those who would be Christians and follow Him; He makes it equally clear in the Gospel that His death is a model for the Christian life. Like Him, we put to death our attachments to the world, and in doing so open ourselves to receiving new life, a completely transformed life in which we are truly existing in unity with God. He showed us by His sorrowful Passion that to be close to God, it is necessary to undergo a profound and agonizing separation from our attachments to the comforts of the world. Not so that we can desert the world and live apart from it, but so that we can love the world more fully as God so loves the world. We are called to live the life of the cross, loving to death our own selfishness by living selflessly for the good of the whole world which we seek to love just as He loves it, showing by our lives the self-sacrificial gift of love offered us by Christ just as Christ showed us the self-sacrificial love of the Father. In this way, we shine most brightly as an imago dei when our life is a visible image of the cross, a constant sacrifice of love to be made willingly so that others might be able to participate in the divine life of love. 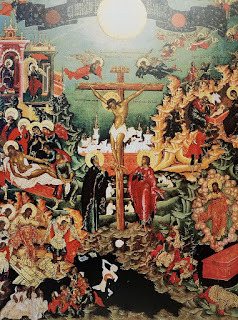 Note: The above is a Russian icon of the Crucifixion surrounded by scenes from Christ's life. On Maundy Thursday, Catholic churches in many places around the world will reenact a part of the Last Supper that is not reenacted at every Mass as are many other parts. At the Last Supper, Christ washed the feet of the Twelve, even the feet of the man who would betray Him. He pointed out to them that he had done this as an example to them, providing a model for them to imitate. Did he simply mean that they should occasionally wash each other's feet at the Seder? No. As usual, Jesus draws us through the viscerally physical into the spiritual, showing us how they are inextricably linked, just as He is both spirit and body inextricably bound up with one another. In Christ, both the body and the spirit are transformed so that their full brilliance can be seen. We are called by Christ to wash the feet of others, to lower ourselves to reach down to the part of them that is dirty and sweaty from walking and working, to cleanse the sores that have developed as they have labored and suffered, to care for the part of their body that has been worn down because it has born the weight of their physical existence. We are called to wash their feet even though we are in authority over them, when God has given us gifts which they have not been given. We are called to even wash the feet of those who are our enemies, those who would betray us for the most mercenary of reasons. This washing of the feet is a reminder that we need to tend to the physical needs of others in tenderness and love, that what we do for His least brothers and sisters we do for Him. It is also a model for the spiritual life that Christ calls us to as we follow Him in the path of love. He calls us to lower ourselves in humility to reach out and care tenderly for the parts of our brothers and sisters that have gotten dirty from walking on the spiritual journey, from their labors of love for the sake of others. He calls us to do so even when we are in authority over them, showing them by our loving service not only our love but also the love of Him who loved us unto death despite having the ultimate authority. He calls us to reach out in tenderness and love even to those who harbor enmity toward us, those who have betrayed us, are betraying us, and will betray us because they value their own immediate pleasures over the greatest good of those they are called to love. He calls us to leadership in the way that He leads us, by lovingly serving us and working for our good despite our betrayals, despite our lack of humility, despite our daily collection of dirt on our souls in each moment in which we neglect to treat His least brothers and sisters with the love He showed to us. We are called to feed His lambs with bread and the Bread of Heaven, to visit them with encouragement and hope when they are in a prison and when they are imprisoned by the darkness of their own minds, to clothe their bodies when they are naked and to clothe their hearts in the warmth of our love when their hearts are chilled by the hate and condemnation of others. In this way, we love to death our pride that strikes us like the Apostle Peter and causes us to cry out, "You will never wash my feet!" We learn how good it is to be served by Christ when we practice serving others. We understand how he gave His life for us when we give our lives for His least brothers and sisters. We come to be willing to accept the gift of salvation through His suffering and death by our own suffering as we strive to bring His gifts to others. As He tells Peter at the Last Supper that he must be willing to let his feet be washed by Christ or have no part in Him, we cannot partake of His divine life of love unless we are willing to accept His loving service, following His example and offering that loving service to others so that they might follow Him as well in rising to a new life, a life radically transformed by full participation in divine love.